SoftPlanet makes it possible for everyone to get free ScreenBlur download directly from our servers. There is no registration needed for downloading. 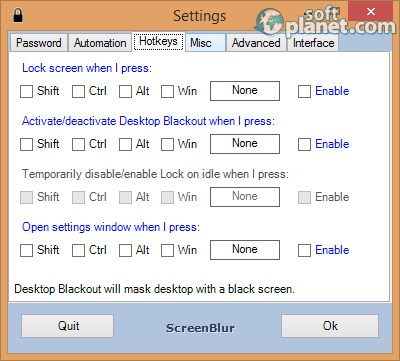 ScreenBlur 1.3.0.23 is a small system tool, that protects your Windows desktop from intrusions by people, who are not authorized to work on your computer. The program is relatively easy to install and gets the job done through an intuitive and easy-to-use interface, that takes just a few minutes to configure. Once you enter all the settings that you desire, the program will blur your desktop and will make it unusable unless you enter the correct password. You can also set the protection to kick in after a predetermined period of inactivity. In addition the software is rather flexible as it offers a number of options, that will help you configure it the way you want. 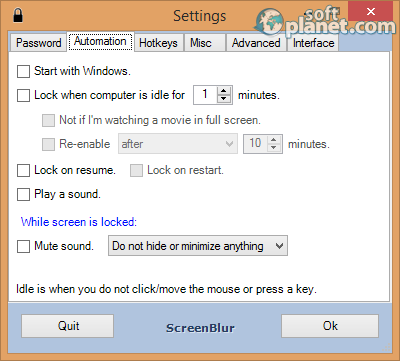 ScreenBlur 1.3.0.23 is a simple program, that protects your Windows desktop from people, who are not allowed to work on your PC. The program boasts several important features, that make it a very good solution – first it is easy to use as it has a very intuitive interface that requires juts a few minutes to get used to it. Moreover, this tool offers flexibility and allows you to configure it in numerous ways, so that it serves you best. There's nothing revolutionary in the ScreenBlur 1.3.0.23 interface, but this is not necessarily a bad thing. The program has a rather small program window with a few tabs, that command various functions of the tool. 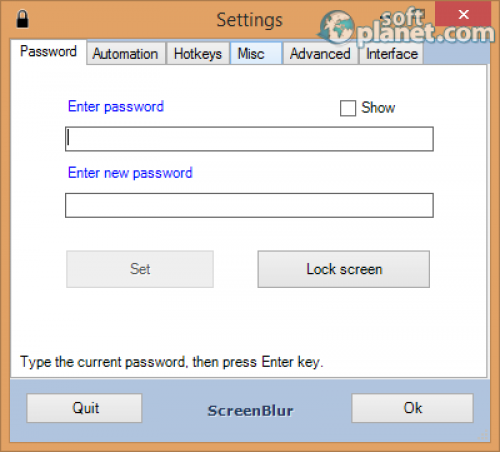 There's a password tab, where you must enter the password, that will unlock your desktop, an automation tab which specifies when the utility will automatically lock your Windows session after a period of inactivity; the Hot keys tab allows you to set various key combinations, that will save you time and effort. You can also change the colors of the program and add or exclude sounds from it. To be able to work with ScreenBlur 1.3.0.23 you must first enter a password, that will protect your Windows desktop from intruders. You can then adjust the various program options to make the program work better for you. The tool works as follows – after a period of inactivity the program will lock the Windows desktop and you must enter your password to make it work again. All you have to do is type it and you will be returned to working mode again immediately. 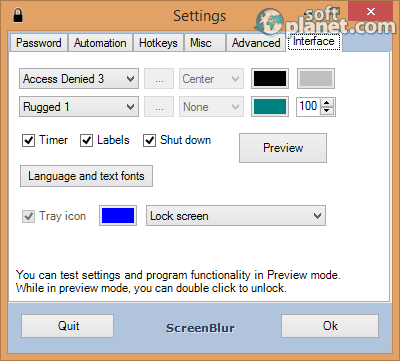 ScreenBlur 1.3.0.23 is a nice system tool, that will protect your Windows desktop from unauthorized access. The program is simple to use and requires a password to be able to do its job; it is also flexible and full of options that you can configure to your liking. It works and works well, but requires additional software, that you may not have, which will make the installation a little cumbersome. If this does not scare you then go for ScreenBlur 1.3.0.23 – you will like it. Our security scan shows that ScreenBlur is clean from viruses. The current version of ScreenBlur has been scanned by our system, which contains 46 different anti-virus algorithms. That ensures that ScreenBlur 1.3.0.23 is 100% safe for your computer.